The star of ABC’s hit Scandal was one of the FEW high profile black actresses who didn’t boycott the Oscars this year (#OscarsSoWhite); however, at least one fashion critic said that this gown may actually be a sort of protest (noting that the leather top reminds the viewer of Beyonce’s Formation performance at the recent Super Bowl). We know that a woman w/ Kerry’s figure and confidence can wear almost anything and pull it off, BUT this dress is NOT quite worthy of the red carpet. Hmmm… I LOVE this color, but the Spotlight actress’ gown comes off as too skimpy (on the sides) and simple for the Oscars. And that train could’ve been hazardous! We know that the star of Carol ALWAYS has interesting gowns (made by Armani), BUT the color is too light (for her complexion). A few style experts commented that there is a BIT too much going on- feathers made into flowers AND the sparkly beading. I thought it looked good from afar. I liked the intricate leaf detail on this gown, BUT that’s about it. The exposed stomach and the lower half of the dress are NOT working for her; but, the Carol actress is still young. The 45 Years actress (who hails from England) was recently in the press for her controversial comments re: the lack of diversity at the Academy Awards. However, you can’t deny her talent and beauty (though NOT conventional for Hollywood standards). Rampling is tall, wiry, and has the type of face that commands attention (often rivaling her male co-stars). You can see her in the 2nd season of UK series Broadchurch (now available on Netflix). She recently turned 70, and this simple/conservative gown suited her well (esp. in close-up). 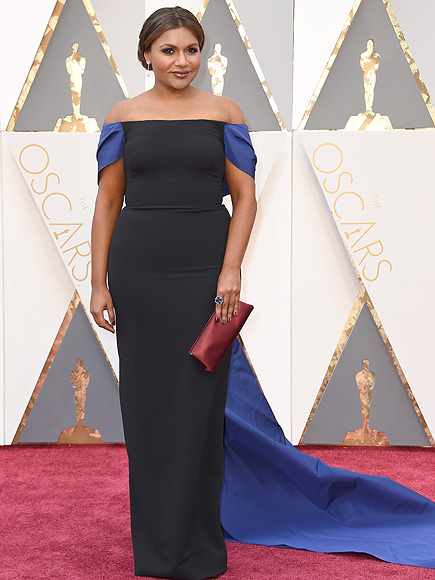 I LOVED what one fashion expert said of this simple gown: “This is a case where fitness trumps fashion.” It seems TOO simple for the Oscars, but the now 40 y.o. statuesque actress can wear anything and look fierce (as we saw in Mad Max: Fury Road). This is a GREAT dress- I esp. love the top! Jennifer’s film Joy may NOT have been seen by a very wide audience, BUT this dress is spot on for the Oscars. Everything about this gown is PERFECT- the cut, color, and embellishments! Plus, she won Best Actress- the best accessory! I saw this dress on Mindy’s Instagram, and it looked elegant. One the red carpet, it comes off as too plain. I like her simple hairdo and the makeup is great (as usual). I LOVE how Mindy has created opportunities for herself in Hollywood- she’s obviously a hard worker and funny lady, BUT this is TOO serious of a gown. The star of ABC’s Quantico was the MOST Googled celeb of the night- WOW! This dress looks FAB on the Indian actress; it reminded me of Halle Berry (back when she was a red carpet darling). Recently, I reviewed Priyanka’s latest Bollywood film, Bajirao Mastani. Did you know this director now has 2 Oscars (for A Girl in the River: The Price of Forgiveness (2015) and Saving Face (2012)!? I need to see these docs still. 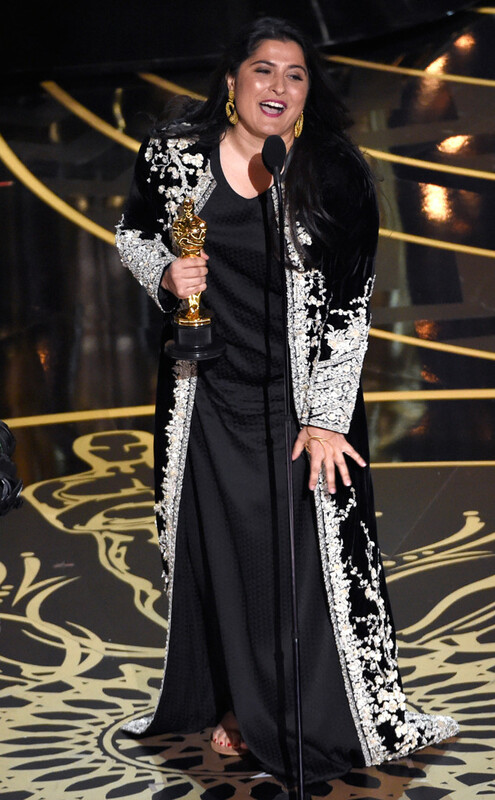 Sharmeen is wearing a simple dress w/ a long, intricate jacket over it (she is Pakistani); at formal desi events all over the world, you will find styles similar to this one. Her Oscar is the perfect accessory! I am not a huge fan of the dress where I see the inside of the breast on anyone. I think it looks tacky, no matter who wears it. Totally agree that Priyanka Chopra’s dress was a stunner — definitely the one I liked best. I also saw a woman wearing a tux that looked cool. I like these fashions that aren’t all about just showing off a terrific young body. I am really angry about Rampling’s remarks but won’t deny that that was a wonderful choice for a dress. Sharmeen Obaid-Chinoy looks stunning too.